Chickens thrive on spending quality time with their feathery siblings and with you, their faithful chicken keeper. They are very social creatures by nature but, just like in people, individual chicken personalities will vary. Some of your chooks may tend to be loud, boisterous, in your face chooks. Others may be calm and quiet and greet you with a soft coo, while still others may be shy and cautious of you. This shy chook needs just a little more time and effort and a heap of patience on your part to establish a mutually rewarding friendship. Shy chickens are just a hop skip and a flap away from becoming your BFF. Let’s egg-splore some tips from the coop on how to win over your shy chicken. Chickens spend much of their day eating and foraging in pursuit of nature’s tasty goodness. It’s very safe to say that chooks are highly motivated by food. Seeing feathery siblings happily approaching and pecking at favored treats you offer is bound to attract the attention of even your most shy chook. This is an egg-cellent example of the monkey see monkey do phenomenon-curious chickens follow curious chickens. By offering your chooks healthy delicious treats, you’ve taken a giant flap forward in encouraging your shy chooks to interact with you and your family. During free range time, throw some favorite treats on the ground near you. You’ll be immediately surrounded by the sound of flauphter-you know that sound that chickens make when they come happily flappily rushing over to see you and you just cannot contain your own laughter! Flapping + laughter = flauphter! Once you’ve observed those shy timid chooks approaching closer and closer to you and your family, lead them even closer to you by offering treats from your hand. Chickens simply adore pasta, bread, cheese, berries, oats-either cooked or raw, scrambled eggs, raisins, grapes and the piece de resistance of every savvy chook’s palate-meal worms. The way to a chook’s heart is through its beak! Whenever you interact with your flock, always speak in a quiet gentle tone, much as you would when greeting a shy young child. Even though you are tempted to get caught up in the latest coop gossip and find yourself egg-static to be in the presence of such eggs-quisite young ladies and egg-ceptionally fine feathered gentlemen, do your absolute best to remain calm, cool and collected. Pretend that you’ve just “collected” the day’s eggs and need to move about carefully to protect your chook’s delicate bounty. By gently stroking your friendlier chooks when they approach you or hop into your lap, shy chooks will learn by eggs-ample that it’s okay to be in your presence. It’s safe! Also knowing the correct way to handle and pick up your chooks can only serve to further your friendship. While enjoying this quality time with your more sociable feathered friends, look around nonchalantly-you will undoubtedly have some clucky onlookers. It’s handy at these times to have a few tricks up your sleeve-have some irresistible treats at the ready in your pockets. 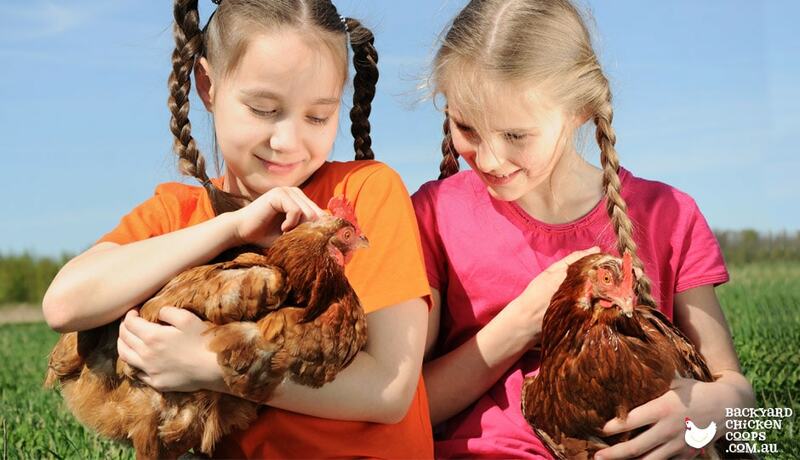 Chatting with your chickens is a wonderful way to interact with your flock. While this may indeed create an uproar of clucking, it can also encourage a shy chook to put her two clucks in so to speak. I like to address my chooks by their names while maintaining eye contact. Sing to them! Or hum. Whistle a happy tune and you’ll be surprised as they happily chime in. I even like to cluck to my chooks. Some stop and just stare. Others will cluck right back, either in surprise at this rather large non-feathery chicken clucking at them or in sheer delight! Daily visits to the chicken coop will help you to develop strong bonds with your chooks. Consistency is key. Relationships of any kind take time to develop. A shy timid chook undoubtedly feels a bit intimidated by you, their loyal keepers, who seem to appear as giants towering above them. Always allow any shy and timid chook to come to you. I know just how difficult this is. Waiting for your chickens to approach you may seem like it could take forever but it is so worth the wait! Patience is truly a virtue when working toward developing a mutually comfortable relationship with even the shyest chook. By incorporating the above tips, I was able to develop a delightful BFF relationship with my Cuckoo Maran, Coco Chanel. Skittish from day one, Miss Chanel was continually cautious of me. When freeing my wee chicks for mommy and chick playdates outside the brooder, Coco just couldn’t allow herself to approach me. She was quite a feathery little track star when it came time to return to her brooder home. It wasn’t until Coco moved in with her older “already living in the outdoor coop” siblings that I was finally able to encourage her to take treats from my hand, calling her by her name and looking directly into her beautiful sparkly eyes. These days, at age two, Coco is still a bit skittish, but happy to see me…or is she just curious to see what tasty treats I’ve brought? That is the question! Cluck, cluck! Hopefully by incorporating these tips from the coop, you will find yourself with a new best friend, a rather feathery and clucky one at that, but a friend just the same. Now, while these tips may seem like common sense advice, I think they merit sharing. Sometimes a gentle reminder is all we need to help us bond with our chooks. With time and patience, you will thrill at the touch of the gentle peck of a sweet shy chook one day as they courageously sample the treats you have in your hand. Now, it’s time to CLUCK-E-BRATE! Celebrate with a backyard picnic fit for your favorite flock. Serve up some feathery friend-friendly foods and enjoy! Cluck, cluck!